That's it... that's all you get! Visit again on June 6th for a chance to win eight bright fat quarters of American Made Brand 100% cotton... and learn a few facts about my home state of IOWA!!! Click on the AMB button on the top of my sidebar to be introduced to this new line of solid 100% cotton fabric, made from start to finish in America! From here you can also visit 18 other blogs and view the wonderfully designed license plates of their respected states... two a day beginning May 19th. The tour ends on June 20th, with the reveal of Alaska and Hawaii. No gas required for this road trip! Enjoy the ride! Who doesn't love a three day weekend? I think we should have them more often!!! The leisurely days were exactly what this working girl needed. After deciding to dive into a new project (once again ignoring the stack of WIP's screaming for some attention), I was determined to get a good number of paper pieced spools completed. I can live with my accomplishment! Nine down... eleven to go! The pattern I'm using is Little Bits... Scrap Happy Spools by Cindi Edgerton. It includes tissue paper foundation for twenty-four 4" spool blocks. I making a twenty block variation, and I'm having fun! For more information about the pattern click here. I spent some time during the weekend working on another project that will debut on my blog on June 6th. For more information, click on the bright yellow American Made Brand button on the top of my sidebar. I'll share a sneak peak in a few days! ... I need to start a new project like I need a root canal. I'm using the rationalization that a three day holiday weekend is approaching. So, here I go. I purchased the pattern last September while on retreat in Minnesota. The picture model on the pattern is done in batiks, but the displayed shop model featured scrappy small prints... my kind of mini. version and a 20 block version. I'm opting for the 20 spool block version. I want a very scrappy look. can't be repeated twice... who does that?!?!?! Road trip... without leaving home!!! Put on your sunglasses, fill up your personal tank with a cup of coffee or tea, and let your computer mouse do the driving! Beginning Monday, May 19th, you are welcome to join the AMERICAN MADE BRAND tour of the great 50 states of America! ...fifty bloggers across the country were selected to re-interpret their state license plate in a finished quilt block size of 12" x 6", using the cotton solids. On this mileage free road trip, you will have the opportunity to view each of the new "plates," and be directed to instructions on how to make each of them. Best of all, you will have a chance to win a bundle of eight fat quarters of the new Cotton Solids! You can enter the giveaway at EACH of the fifty blogs you visit! I am happy and honored to have been selected to re-interpret a fabric license plate for IOWA! Ready to begin the tour? Beginning Monday, May 19th, visit the American Made Brand blog. (There will be a button to my sidebar for you to click on as well). From here you will find the daily schedule of states to visit, two a day, until Friday, June 20th. The states will be visited in the order they were declared statehood. I will post my fabric license plate on day fifteen of the tour, June 6th. I will have some fun facts about IOWA for you to read about as well! Enjoy the road trip... and hang those sunglasses on the rear view mirror so you don't miss a thing! It's Been a Merry Month of May! 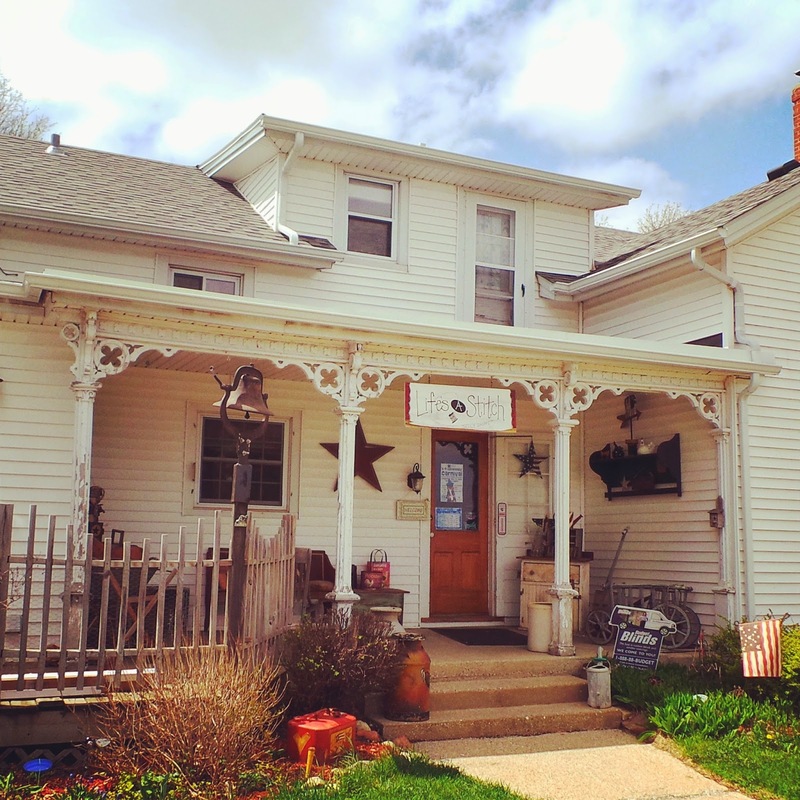 I've been home for a few days, after travelling to my home state of Wisconsin to visit family, do a little flower planting in my Mom's garden, go crazy in a couple of quilt shops, and crazier in the largest greenhouse and garden center I've ever been in! Here's a few pictures to show you what's been going on in my world! the clouds parted and I was greeted by blue sky! love at first sight! More on this place in a future post! garden, is a springtime ritual. the pot of marigolds, but he's very real! By early evening the scene was ready for the "after"
once the flowers are pouring over the edges! are very happy... it's a "no vacancy" zone! the "path" between all the blocks. block I have made. I think I like it!!! Before I knew it, my day of departure arrived. Goodbyes with Mom are always a little tearful... hugs linger longer. She so desperately wanted to join my sister and I on the last road trip stop we would make together on Tuesday morning. (My sister insisted I visit a greenhouse she discovered about 2 years ago. And since it was on my way out of the state...) There was no way my Mom would have been able to handle the narrow aisles and uneven grounds of a large greenhouse, inside and out, with her walker. She reluctantly realized this too, and in the end it was good that she remained at home. It was cold, windy, and raining... not the best conditions for flower shopping, but girls gotta do what girls gotta do!!! two hours it took me to get home! Back to life as I know (and love!) in Iowa. The rest of the month holds birthday celebrations, tee-ball games, grade school music concerts, and an exciting sewing project that I will share with you in the next couple of days! This one has me pumped up!!! ... means another Lucy Boston block. 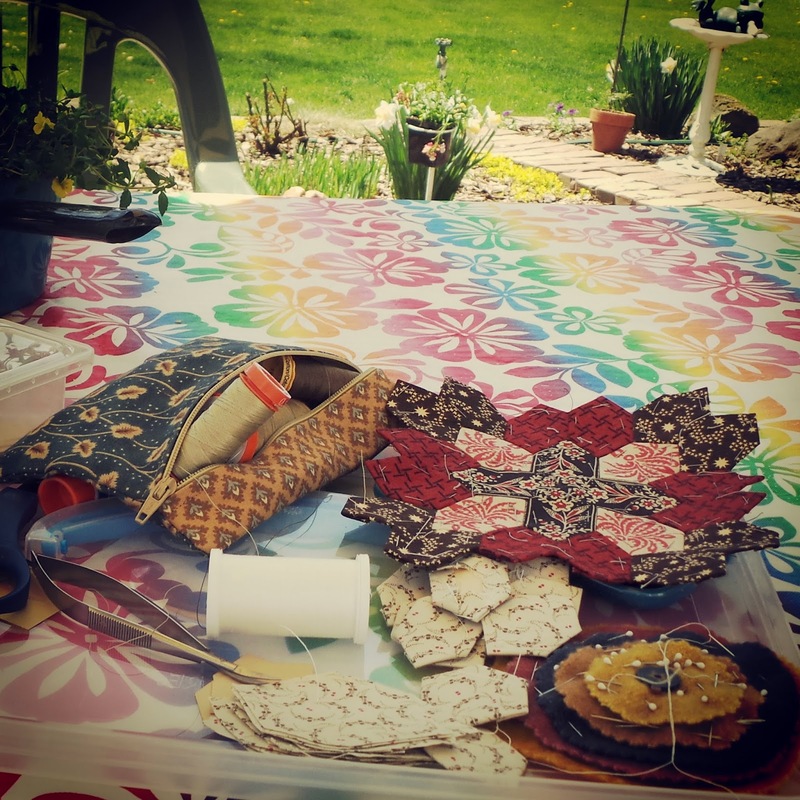 Back in February I invited a few other EPP (English Paper Piecing) fanatics to join me on the first Saturday of the month to begin making Lucy Boston blocks, inspired by Linda Franz Patchwork of the Crosses. I used 1" honeycomb paper pieces to make my February block. Shortly after completing it, I decided to use fabrics that fell into a color scheme of red, brown, and beige. I also decided to make smaller blocks, so I switched to 3/4" inch honeycombs. (It is a woman's prerogative to change her mind whenever she wants, and how often she wants... so I try to do my share in the name of womanhood!) This past Saturday I finished my third block... the top, left, in the photo above. My plan is to make 16 blocks... but I may change my mind... it's my prerogative. Here's a close up of the blocks (partially), and the fabrics that I have chosen for block number 4. If time allows, I may start on this one before our Saturday get together in June. I'll be travelling to my home state of Wisconsin later this week to visit my 90 year old Mom, 2 of my 3 siblings, and other family members. 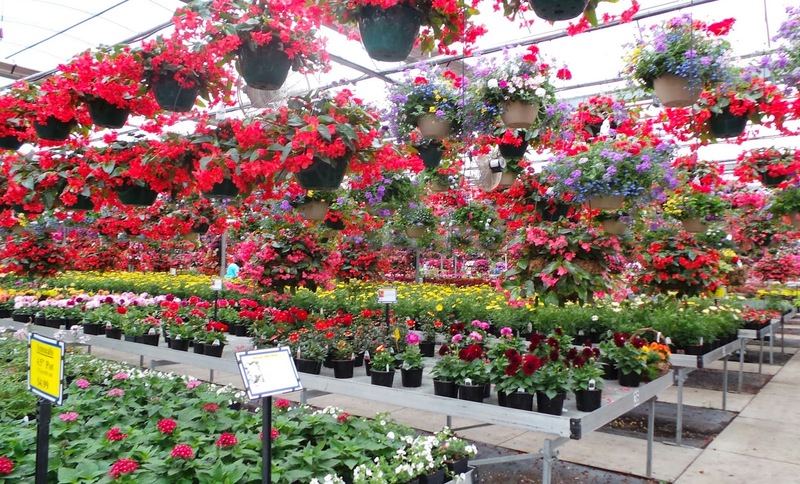 Time will be spent visiting several greenhouses and prepping Mom's flower garden for a spectacular summer of blooms. And it wouldn't be a road trip without stopping at quilt shops along the way... my camera is ready! Early wishes for a Happy Mother's Day to all the quilting, sewing, and crafty MOMS in blogland! Enjoy YOUR special day!! !